Although David Bowie tragically passed away earlier this year, his music will live on for generations to come. But apparently, an unparalleled legacy isn't the only thing Starman left behind for us. In fact, at least one of his Easter eggs was uncovered just this week. Reddit user BoldlyGettingThere shared a photo of Bowie's final album, "Blackstar" LP, on Monday that shows the gatefold looking spectacularly different that usual, with the solid black cover transformed into a field of glowing stars. Apparently, this isn't a photoshop or an illusion -- in fact, if you actually own the album, you can recreate the effect at home. 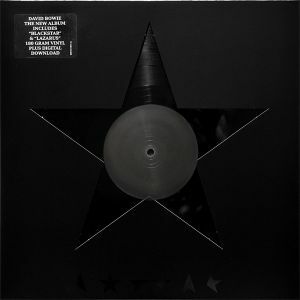 "A friend discovered that if you expose the Blackstar gatefold to sunlight a starfield appears," the caption read. "What a beautiful secret." Bowie's 25th studio album, which came out on his 69th birthday and just two days before his death, was the first that did not feature his photo on the cover. Sharing a story about the spectacular surprise, his son Duncan Jones wrote on Twitter, "Leaving us surprises even now. So clever. So missed." Oh, and if you're concerned about causing irreversible damage to your beloved memorabilia, worry not: Once the light source is removed, the galaxy fades away.